DY Concrete Pumps carries steel and plastic blades as well as pans for most common trowel brands in stock. With the largest blade and pan inventory in Western Canada, we’re able to supply our customers with the highest quality product, for a low price. Finishing with steel power trowel blades can leave undesirable dark burnish marks which discolor the floor. Above: A steel blade was used to finish light-reflective concrete. Notice the darkness created by the steel blade. Wagman plastic blades allow you to trowel light-reflective or colored concrete, epoxies or any application where burnish marks are a concern. 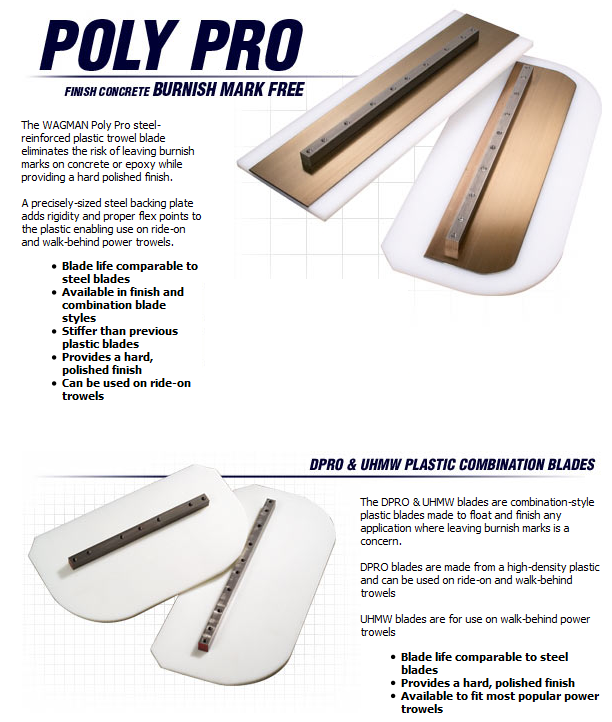 Above: The Wagman Poly Pro plastic finish blade produces a hard bunish-mark-free finish on light-reflective concrete. It is not hard to see the advantage of using plastic blades but the next question is always, “how long do they last?” In several field applications around the country Wagman plastic blades have consistently lasted as long, if not longer, than steel blades used on the same job. How is this possible? Wagman plastic blades use a thick, specially formulated abrasion-resistant plastic made to stand up to the demands of finishing concrete.